Hyperspectral image registration is a relevant task for real-time applications like environmental disasters management or search and rescue scenarios. 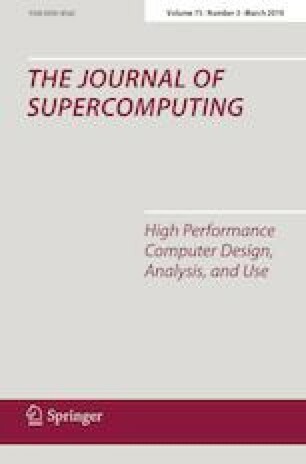 Traditional algorithms were not really devoted to real-time performance, even when ported to GPUs or other parallel devices. Thus, the HYFMGPU algorithm arose as a solution to such a lack. Nevertheless, as sensors are expected to evolve and thus generate images with finer resolutions and wider wavelength ranges, a multi-GPU implementation of this algorithm seems to be necessary in a near future. This work presents a multi-device MPI \(+\) CUDA implementation of the HYFMGPU algorithm that distributes all its stages among several GPUs. This version has been validated testing it for 5 different real hyperspectral images, with sizes from about 80 MB to nearly 2 GB, achieving speedups for the whole execution of the algorithm from 1.18 \(\times \) to 1.59 \(\times \) in 2 GPUs and from 1.26 \(\times \) to 2.58 \(\times \) in 4 GPUs. The parallelization efficiencies obtained are stable around 86\(\%\) and 78\(\%\) for 2 and 4 GPUs, respectively, which proves the scalability of this multi-device version. This work has been partially supported by: Universidad de Valladolid—Consejería de Educación of Junta de Castilla y León, Ministerio de Economía, Industria y Competitividad of Spain, and European Regional Development Fund (ERDF) program: Project PCAS (TIN2017-88614-R), Project PROPHET (VA082P17) and CAPAP-H6 network (TIN2016-81840-REDT). Universidade de Santiago de Compostela—Consellería de Cultura, Educación e Ordenación Universitaria of Xunta de Galicia (grant numbers GRC2014/008 and ED431G/08) and Ministerio de Economía, Industria y Competitividad of Spain (Grant Number TIN2016-76373-P), all co-funded by the European Regional Development Fund (ERDF) program. The work of Álvaro Ordóñez was supported by the Ministerio de Educación, Cultura y Deporte under an FPU Grant (Grant Number FPU16/03537).